So this weekend it happened...I got to try the beer from my first batch. I am a little indifferent about it...because of the following reasons. 1. It is an Irish Red which came with the kit. I am not a huge Irish Red fan as it reminds me of Killians Irish Red. 2. It reminds me of Killians Irish Red. ha. 3. It was a little lower on carbonation which isn't a huge deal but was expecting a little more head. I can pour the beer straight up and down and I get the desired 1-1.5 inches of head. 4. It smells a little like old beer (you know the smell when you walk into a place that just smells like beer is on the floor). 5. It really is lacking some complexity. A little sweet at the finish. It is super easy to drink ( I can drink one down in about 2 minutes) and my wife said "it is a little watery". Thanks for the thumbs up is what I said. 6. I wasn't able to get a good rolling boil (did it on my stove with a 15 gallon SS megapot) so my wort might have not been the greatest. 7. Super low visible fermentation activity (2 days of active signs) and then it was done. 8. No sediment at the bottom of the bottles like I was expecting, which is fine with me but was expecting the sediment. 1. It was my first homebrew and I am super excited to get started on the next one. 2. 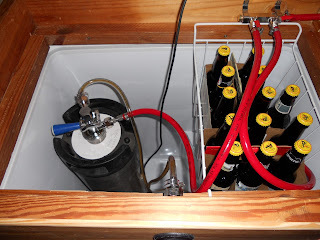 I think I have learned tons since my first brew day which will help with my process (i.e. boiling, hops, etc.). 3. It is not bad and can easily get through the 2 cases. 4. AHA forum was a huge help to me and I thank you all. So, overall not a bad brew but by far not my favorite. Practice will help me and I am excited to brew the next batch. But congrats on your first beer!!!! Sounds like you've already learned a lesson that I struggled with starting out,... "Regardless of what happens, you will make beer"
congrats! enjoy it and get started on that next batch. 1.010 is not to low for a lightish ale. +1 on oxidation if it tastes/smells like slightly stale beer. Give it a little more time at room temp to carb up the rest of the way, this should take care of the slightly sweet, the lack of sediment and possibly the watery impression as proper carbonation makes a huge difference in the perception and mouthfeel of a small beer. My OG was 1044 which was spot on for my kit. I have to figure out the oxidation situation. I don't want to ruin batches due to this problem. I am hoping some more time to carb will help. It has been carbing for 2 weeks at room temp (65 degrees). Cheers to progress on the next batch! I'm thinking of an IPA. Now that you've had one....pay attention to them over time. If you bottle conditioned and tried it after 2-3 weeks, it may not be fully carbonated (depending on temperature). this might account for the sweetness as well....1.010 should be nicely fermented (depending where you started, but an Irish Red should have started in the 1.040s-50s). I also noted in my experience that a nice creamy head tends to develop after 4-6 weeks after bottling and as long as there isn't oxidation the flavor complexity improves...so you might be surprised in a few weeks as the character changes. Good luck trying to save them from yourself. I think you answered your own questions about what to do next time.....find a way to actually boil as much wort as you can. give us a rundown on your process and we can maybe pinpoint any oxidation points. If you are doing extract batches the OG should pretty much always be spot on with what the kit says. How much sugar did you use to prime? did you make sure it was well mixed with the beer before bottling? if so, how did you ensure mixing? That's a tricky moment because you want the sugar thouroghly mixed in to avoid variable carbonation levels in the bottles but you also want to be very gentle with the beer to avoid oxidiation. Id it was LME, it's possible the extract was already oxidized and it didn't happen during the process. Here is the rundown of the process. Got the water up to a small boil (as I couldn't get it up to a rolling boil) and put in the extract. Boiled for 60 minutes and then cooled it in an ice bath. Super slow and for sure need to get a chiller. Racked it into a 6 gallon carboy and pitched the yeast. Swirled and rocked it to get the yeast going. After about 24 hours started to see fermentation activity but it only lasted about 2 days and then the krausen sunk back down. Sat in the primary for 2 weeks. Racked it into the secondary, trying to avoid splashing and sealed it up. Sat in the secondary for 2 weeks and clarity greatly improved. Bottling day. Sanitized all my equipment and bottles. Mixed up the priming solution. The kit came with priming sugar but did not indicate what kind of sugar it was. The instructions indicated 2/3 cup in 16oz of water for corn sugar or 5/8 cup in 16oz of water for table sugar. The sugar was rather fine and made the assumption of 2/3 in 16oz. It had roughly another 1/4 -1/3 of a cup left in the bag. But I figured I would follow the instructions rather than use all the priming sugar it came with. Boiled the sugar and water and let it cool. Added the priming solution to the bottling bucket then racked from the secondary to the bucket. Mixed it with my auto siphon. Trying to avoid splashing but tried to ensure mixture with some figure 8 motions. Then bottling. A little more difficult at the beginning with some spilling but got significantly better after a few bottles. Filled 24 bottles then capped. Filled the other 24 and capped. Sat at room temp for 2 weeks. That is a rough rundown. Any suggestions or thoughts are helpful. Skip the secondary, as it is generally unnecessary. Two days to ferment a smallish beer is not out of the ordinary. Even at room temp, I'd give it more than two weeks to carb up fully. Although I never did so, it's better practice to weigh your priming sugar than to go by volume. Try to get the temp up to 68 or 70 for bottle conditioning. Take 2 bottles and move to a warmer area let sit a few days and see if notice a difference between one sitting at 65 and one sitting at 68-70. Good luck and start your second batch already. [...]Racked it into the secondary, trying to avoid splashing and sealed it up. Sat in the secondary for 2 weeks and clarity greatly improved. could well account for the stale taste. hmmmmmm. Well I have read that secondary really just helps with clarity and being a noob, I was worried about the brew sitting on the yeast cake for super long. So, I transferred to the secondary because that is what the directions called for. I am hopefully going to be working my way into all grain soon but want to get the process under my belt first. Figured a few (maybe 5) more extract brews and then make the leap. Thanks for all the suggestions and thoughts. Next brew day is in the planning stages....thinking of going with an extra hoppy IPA. Congrats on your first brew! Yours turned out better than mine, that's for sure. My first brew got too hot during fermentation and I also racked to a secondary just because the instructions w/ the kit said so. After getting advice from everyone on this great board, I haven't transferred to a secondary since. Not saying there's not a time or place to do so, but so far I haven't needed to. I even let a winter warmer sit on the yeast cake for two months and it tastes great! As for clarity, usually my first few pulls off the keg will be a little "hazy", but after that, they start to really clear up. Good luck w/ the IPA and let us know how it turns out! Conventional wisdom has changed in the last 5 or 6 years concerning secondary and autolysis. When I started brewing everybody followed a silly 1-2-3 rule:1 week in primary, 2 weeks in secondary, 3 weeks in the bottle. Now 2 or 3 weeks in primary and no secondary is considered normal for most beers in most circumstances. Remember that it isn't the secondary that clears the beer, it's time and gravity, and they both work as well in your primary vessel. There's also less oxidation and risk of infection if you skip the secondary. I've left beer in primary for up to 6 weeks before I had a chance to keg it, it was still delicious.